Sketch by an unknown artist of a spinning woman in front of a hut. Sketch by an unknown artist of a weaving woman. Sketch by an unknown artist of a spinning-wheel. Sketch by an unknown artist of a basket weaver in front of a hut. Sketch by an unknown artist of various spinning-wheels. 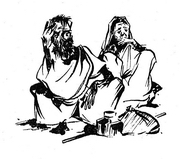 Sketch by an unknown artist of a starving couple (Daridra Narayana). Sketch by an unknown artist of begging children (Daridra Narayana). Sketch by an unknown artist of a dying/dead woman and a man bending over her (Daridra Narayana). Sketch by an unknown artist of a starving mother with her child (Daridra Narayana). 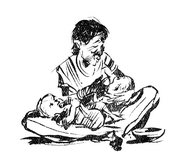 Sketch by an unknown artist of a starving mother breast-feeding one child with another one on her lap (Daridra Narayana). Sketch by an unknown artist of starving people on a treck (Daridra Narayana). Sketch of an emblem symbolizing lotus flower. Collage of newspapers Mahatma Gandhi acted as chief editor for.